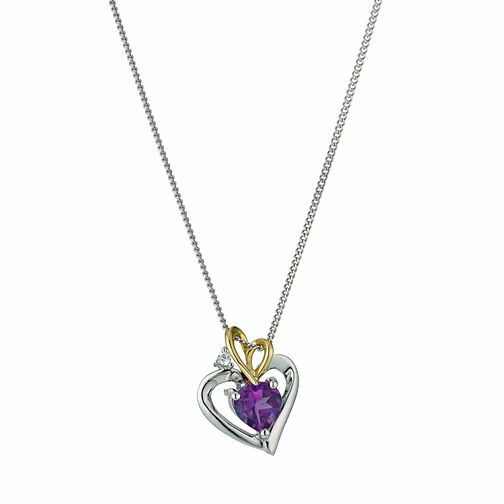 Silver pendant featuring an unusual cut out heart design featuring a 9ct yellow gold smaller heart at the top, cubic zirconia detail and an amethyst at its centre. Silver & 9ct Yellow Gold Heart & Amethyst Centre is rated 3.7 out of 5 by 7. Rated 5 out of 5 by Anonymous from Great present! I bought this pendant for my mum's birthday and got the best reaction! She had wanted it for a while prior and it was great length and the pendant was the perfect size for her. It sparkles in all the right places and she has already had many compliments! Would definitely recommend, especially with the gift wrapping option, where you can enter your own personal message. Lovely touch!